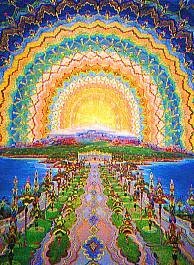 Visionary artist Joseph Parker emigrated to Australia from his native Czechoslovakia in 1951, where he studied to become an accountant. He abandoned accountancy at the age of 32 for art, at first making realistic paintings to make a living, but from 1967 on he devoted himself to visionary images suited, as he says, 'for the Aquarian Age'. At the time there was little interest from galleries in such pictures and he sold work through personal networks. 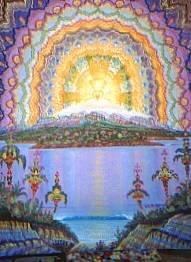 Parker now lives in California, where a section of the artworld deals in visionary art, although he displays little interest in its activities and concerns himself only with trying to make great paintings. He is unconcerned with personal promotion, saying that he has enough money to live on, and believing that recognition will come naturally in time. For him, only taking time to make new works while his eyes and health are good is important.